See Using Data types, input fields and operators for more about the fields and operators that are available in the UI. The name of the segment shown as its title. Demographic highlighted in a small box. Select the system generated name and enter one of your choice. Ensure that the name you use is unique, descriptive of the rule, and can easily be recognized by yourself and others in the future. Under Match, select whether the contacts that are to be identified by the rule should match ALL of the conditions you define in the next steps, or ANY of them. If you select ALL, the number of relevant contacts, which is displayed at the top of the page, reduces as each condition is applied. If you select ANY, the number of contacts increases. See Combining conditions within a rule for more details. Apply none, one or any combination of these conditions. Delete them as appropriate, by clicking the Bin icon. Click the downwards pointing arrow to the right of the first box, and select the appropriate operator, for example, Not equal to, from the drop-down list. Enter the required first name, for example, John, in the Free text field. The system displays the number of contacts in the database that match the condition. If, for example, you want to search for two first names, such as Janet and John, you can either create two rules, or set Match to ANY and add another Name condition for the second name. See below for details about adding further conditions. Continue to define the standard conditions as required. The conditions that are initially displayed are configured on a customer-by-customer basis, when the system is set up. They can be changed at any time, using the Field settings page, which can be accessed through the Settings tab in the Control bar. See Field settings for more details. In the Add condition panel, click the downwards pointing arrow to the right of the box, and select the appropriate condition, for example, Country, from the drop-down list. The new condition is added to the list. Click the downwards pointing arrow to the right of the first box, and select the appropriate operator, for example, Equal to, from the drop-down list. The first box may display a different list of operators, according to the type of condition being defined. See Operator types for more details. Enter the appropriate value in the second box. The the input field type varies, according to the condition that you are defining. See Input field types for more details. An absolute date to be chosen, using the calendar widget. A relative date to be selected, such as one week ago, or two months in the future. Click the opposing horizontal arrows icon, to the right of the calendar or relative date field, to change to the other field type. See UI icons for a description of each icon displayed in the UI. If you want to create a preset from the rule you have defined, click Save as preset, before you apply the rule to the segment. Click Add to apply the rule to the segment, or Cancel to abort the process. 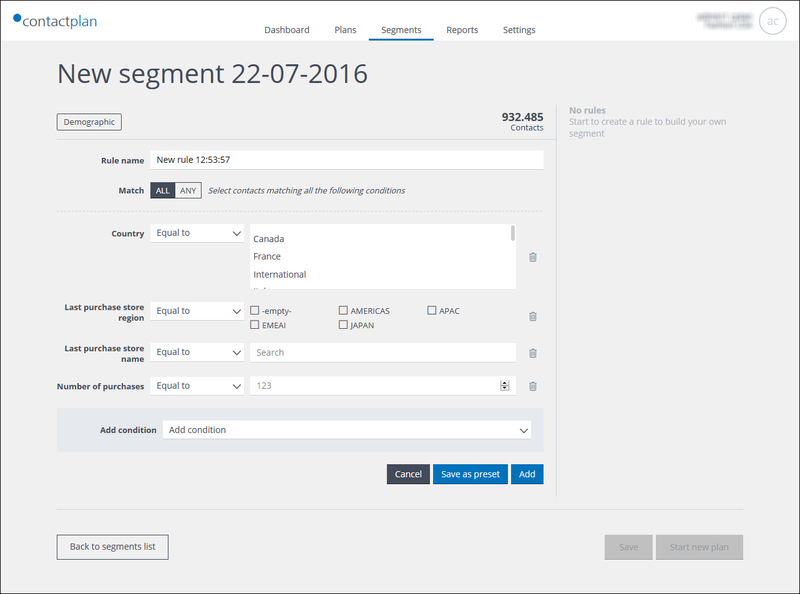 You are returned to the New segment page and the rule is added to the Rule list area of the Segment Summary panel.